De Stijl / The Style / Neoplasticism - in quotes. De Stijl [Dutch for 'The Style', also known as 'Neoplasticism'], was a Dutch modern art movement founded in 1917 in Amsterdam. 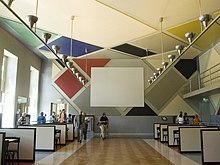 De Stijl consisted of artists and architects. Proponents of De Stijl movement advocated pure abstraction and universality in painting art; they simplified visual compositions to the vertical and horizontal directions, and used only primary colours, along with black and white. Piet Mondrian, 1917: 'Composition with flat colors 5. Art is higher than reality and has no direct relation to reality. To approach the spiritual in art, one will make as little use as possible of reality, because reality is opposed to the spiritual. We find ourselves in the presence of an abstract art. Art should be above reality, otherwise it would have no value for man. The problem which Piet Mondrian undertook to solve in nr. 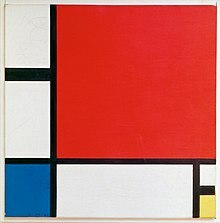 116 [a new painting of Mondrian, exhibited then in the Stedelijk Museum in 1915, Amsterdam] was handled very successfully. This work spiritually dominates all others. It gives the impression of Repose; the repose of the soul. Its pre-determined structure embodies 'becoming' rather than 'being'. This represents a true element in art, for art is not 'being', but 'becoming'. The idea of 'becoming' has been expressed in black and white.. .Through years of hard work my own experiences have led me, before I came to know the theories of Uexkuell or Picasso, to prefer the use of the white-black-grey palette in works of a purely spiritual content..
As you can see this is a composition of vertical and horizontal lines which will (in an abstract manner) have to express the idea of rising upwards, of magnitude. This is the same idea which used, for example, to be the guiding principle in the construction of cathedrals. Since only the manner of expression and not the representation has to express this general idea, I have not given any title. An abstract human mind will, of itself, receive the intended impression. I always confine myself to expressing the general. The new plastic idea [= De Stijl / Neo-Plasticism] cannot, therefore, take the form of concrete representation, although the latter does always indicate the universal to a degree, or at least conceal it within. This new plastic idea will ignore the particulars of appearance, that is to say, natural form and colour. On the contrary it should find its expression in the abstraction of form and colour, that is to say, in the straight line and the clearly defined primary colour. The development of plastic art is determined by the will to visualize. Art of the past represented the subjective vision of 'naturalistic relationships'. Neo-Plasticism [= De Stijl ] embodies a subjective vision of 'plastic relationships'.. .Pure thought, which does not signify a concept derived from natural phenomena but which is contained in numbers, measures, relationships and abstract lines, is revealed conceptually (as Reason) by Chinese, Greek and German philosophy, and aesthetically by contemporary Neo-plasticism. And then about whether or not to work from a given in nature. In my view, you [[w:Theo van Doesburg|Theo van Doesburg] define this in a rather narrow sense. In the main, I do agree with you that the destruction of the natural, and it reconstruction, must be accomplished according to a spiritual image, but I believe that we should take a broad view here. What is natural does not have to be a representation of something. I'm now working on a thing that is a reconstruction of a starry sky [in the painting: Composition, Checkerboard Dark Colours, 1919] and yet I'm making it without a given from nature. Someone who says he uses a theme from nature can be right, but also someone who says he uses nothing at all. I believe that new art must differ totally in its manifestation from art as we know it, and people may be very reluctant to accept this. It is perhaps true to say, as someone did of cubism, that 'To sum up: since art is a need to create rather than imitate, the 'cubists' rousing themselves from the sentimentality born of the picturesque aspect of some natural spectacle or other, disengage the fleeting aspects from those which are constant and absolute, and with the aid of these two elements, construct a reality equivalent to that which they see before them'. Thus it is a question of finding the true equivalence (that, offered by Cubism is still not true equivalence), and this can only be 'that which is not nature at all, and is nonetheless one with nature' [like in Neo-Plasticism / De Stijl ]. Until now, man has let himself be lulled to sleep by pathetic lyric. That is why it is so fatal for the evolution of man, for all his activities, his necessary fight for equilibrium. On the other hand it has overfilled man with tragedy: tragedy has been so overrated that people have had enough. And already this is visible, man tries to ban it from all forms of art. Thus art achieves its goal at last; it takes evolution to balance..
Quote of Piet Mondrian, in 'Cercle et Carré' No. 2, 1930; De Stijl art magazine, published in Paris. Not only in the manner of presentation, but also in the subject, De Stijl / The Style artists [a. o. Mondrian, Theo van Doesburg and the Belgian artist Vantongerloo imposed limits upon themselves. They exclude all individual life – in general each special instance – and attempt to dissolve themselves to a more abstract and universal form of life, where there is no place for coincidental extras. As far as the subject is concerned, the aspiration of De Stijl artists is based on what they call the universal or cosmic, as opposed to individualistic artists.. ..even in the expression of the subject, De Stijl artist subjects himself to the same strict means and his individuality will only be apparent in the way he uses these means. This can be seen in the proportions of the composition, the rhythm, the way he applies the paint and, as far as is possible, the colors. ..De Stijl artist sees all enclosed, geometric figures as 'descriptive', 'individual' and, as such, too much preconceived 'form'. They feel themselves to be locked up in a figure, and thus cut off from the entirety of life, the universe.. .. Generally speaking, they use only means that can be broken or destroyed. These are means that can be used together with their opposites, such as a straight line with its rectangular opposite. By using them both together, the individuality can be deleted. For this reason they are called universal means. It is very clear that De Stijl / The Style artists recognize and use the plane, they do not try to make it into a three dimensional pseudo space, nor do they create a pseudo depth. Three-dimensional space would only increase the chance of creating form, and deceptive form at that. Not filling in the forms evenly would also work descriptively and would also obscure the color.. .Not only do De Stijl artists limit their use of color to the basic red, yellow and blue, but, over time, they also use the three less and less together. Mainly they chose colors that symbolically contrast..
Reasoned / intellectual lines exclude all lyrical and dramatic emotion, reasoned/intellectual colors do the same. They exclude all mood. Only an active rather than passive disposition can reflect them. They do not carry us away as do the flowing differences of emotive colors. They stand before us, and each other, like naked facts.. .. they search for unity in contrasts, internally as well as externally. They achieve this unity by balancing these more or less reasoned/intellectual colors, by their positioning, stance and size. De Stijl / The Style artists who focus entirely on the 'absolute', see life in all its facets as a search for balance between extreme contrasts: man-woman, objective-subjective, universal-individual, internal-external etc. Sometimes one is dominant and sometimes the other.. .However, the ideal is that by allowing equal dominance, both extremes create an annulment of one’s own separation, thus coming from most sensitive tension to balance. For De Stijl artists, the true art of painting is nothing other than balancing the opposing universal means. Mondrian and Van Doesburg do mention the word 'symbol', however they use it only in the unfavourable meaning of allegory. Wassily Kandinsky is less afraid. He says in his Bauhaus art book 'Punkt und Linie zur Fläcke': 'Of course the new science of art can only develop when the signs translate to symbols, and the open eye and the open ear make the way possible from silence to speech. Those unable to do that would be better off learning only theoretical and practical art'.. If one or other symbol has only suggestive power, and if it dominates all other symbols available, De Stijl artist will never use this particular symbol.. .For instance, a large black square on a white background. This symbol, ignored by The Stijl artists, played a large part in work by Suprematism-artist Malevich. I still think that Boccioni was a great artist and a passionate man. I like El Lissitsky's painting very much. But Mondrian that great merciless artist, is the only one who had nothing left over. The point they all had in common was to be both inside and outside at the same time. A new of likeness! ..for me to be inside and outside is to be in an unheated studio with broken windows in the winter. Quote by Willem de Kooning, 1951, in his speech 'What Abstract Art means to me', on the symposium 'What is Abstract At' - at the Museum of Modern Art, New York, 5 February, 1951, n.p. The ultimate consequences of its universal ambitions were formulated by 'De Stijl' in its programme of utopian desiderata. A new life, a new reality was to arise, according to the universal principles which the painters of ‘De Stijl’ had rendered completely visible for the first time in history. But not all of 'De Stijl's efforts were concentrated on a utopian, remote future. The purification of the plastic means of expression, should also serve to solve various actual problems of our present time. The pure means of expression could, in the first place, create a clear and universally current plastic language. This means that they were able to launch a style into present-day life..
Every field of artistic activity seems to have been inspired by 'De Stijl' dynamic and purifying attitude. Architecture in the first place bears the marks of 'De Stijl' and no wonder, for a series of daring and revolutionary projects had already been realized by the group. But its influence is not limited to architecture only, because it does not emanate from any specific work of the group. It is mainly due to the activities and the dynamism of Theo van Doesburg - 'De Stijl's' gifted and courageous leader. He propagated 'De Stijl's' principles and achievements all over Europe and by his fascinating lectures - the one I heard as a schoolboy has since remained in my memory as one of the most impressive speeches I have ever heard - and his great personal charm, he would find an echo even in the remotest corners of the Continent. They want to get hold of things, like Mondrian. He was a fantastic artist, but now when we read his ideas and his idea of Neo-Plasticism [= De Stijl] – pure plasticity – it's kind of silly, I think. I mean, not for him, but I think one could spend one's life having this desire to be in and outside at the same time. He could see a future life and a future city – not like me, who am absolutely not interested in seeing the future city. I'm perfectly happy to be alive now. Well, Mondrian is absolute, and is pure, and those are real aspirations of our [American Abstract Expressionism art]. When I say 'pure', I don't mean 'clean'. I don't think Mondrian himself did; I knew him when he was here [New York] during the war.. .As for me, I must say, Mondrian's painting is intensely rhythmic, warm, passionate - restricted as the means ostensibly seem to me.